Nine players assembled on Friday 16th August for the weekend of full lawn association handicap croquet, scored by the Egyptian method. This results in points being scored throughout the tournament and the overall winner is the player with the most points, trophies are given in differing handicap divisions. The weather was varied, most players got pretty wet on the Saturday and the sunblock came out for Sunday. Those having travelled furthest, Glasgow and Norfolk, left early having played all their games. Pendle & Craven club members: Roger Schofield and Garry Wilson did well with Garry being in prime slot for most of the tournament in the over 10 handicap competition, but he was pipped to that trophy by Alan Morton from Fylde with 115 points. 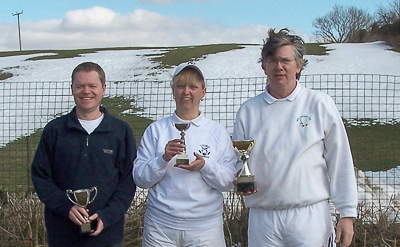 Roger won the low handicap trophy with 116 points, but Janet Davies from Chester was overall Winner with 120 points. The final day was enlivened for the watchers by a mass emergence of crane flies from the lawn edges, the weather having suited them. d to give 1 bisque (1 free shot) in his match with Jacob. Andrew triumphed with a single hoop win. In spite of Jacob’s presence, the Pendle & Craven team rose to the occasion and both Andrew Webb and Garry Wilson (handicap 18), won both their games, whilst Catherine Parnell and Robin Delves (both handicap 10) managed to beat Jacob Carr and Peter Wallace (handicap 10), who is Jacob’s grandfather, in the doubles again by one hoop. Thus a very good away victory for pendle & Craven by 5 games to 2. Some could say the joke was on us. A hardy bunch of volunteers spent Maundy Thursday clearing snow drifts from the croquet lawns in order for play to start on the Friday. An equally hardy bunch of players turned up on the Friday to compete for the various honors on offer. Paul Rigge from Bury, another club founded by John Beech, managed the tournament which featured both handicap and advanced play. With sunshine but stiff breezes some shots may have been hampered by clothing and the warm pavilion and hot food kept frostbite away. Three players from Pendle and Craven: Roger Schofield, Paul Dowdall and Garry Wilson battled the other 12 players who travelled from croquet clubs as far away as Glasgow and Middlesbrough to compete. The manager, Paul Rigge, took the overall trophy, the John Beech cup. The most games of Croquet played was a three way tie between Paul Rigge, Betty Bates and Matt Holmes. It’s not very often that Croquet shares a venue with winter activities but with children enjoying the Bank Holiday sledging on the slope at the back, we played Croquet in the bright sunshine at Earby. The weather stayed as forecast, dry and bright but with a bitterly cold easterly wind blowing, only the in-player went outside to brave it. Easter Sunday was the coldest on record with overnight temperatures hitting -7C. Playing a mixture of advanced & handicap games, Paul only dropped a single game on his way to the title over the four days of competition, overcoming anything up to 20.5 Bisques multiple times. Over the four days, various players floated into contention only to fall back into the pack. Last year’s winner and club mate, Andy Brandwood had a good campaign and finished in third place behind Joe Lennon (Glasgow).